Itchan Kala, the inner town of Khiva, is a preserved example of a Muslem city in Asia at the beginning of the 19th century. The town is completely surrounded by brick city walls, which have four gates at the cardinal points. The oasis of Khiva was the last halting place for caravans before the desert in Iran. 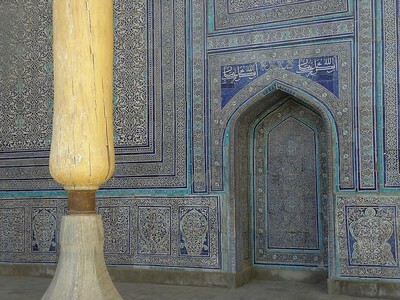 Since the 4th century it was the center of Khorezm civilization, an Iranian kingdom famous in Antiquity for its hydraulic techniques. Nowadays, Itchan Kala presents unique examples of moslem architecture in the Djuma mosque and the many medressehs. There is also traditional domestic architecture: enclosed houses with courtyards, reception room and private apartments. At first sight the Itchan Khala of Khiva is a deception: an almost empty open air museum, except for numerous French tour groups with loud guides. Where have I landed? Is this the once so remote oasis town? The monumental walls, gates and other historic buildings in town look over-restored as well. Fortunately I stayed here for two nights, and it certainly grew on me. My hotel (the Arkonchi) is located within the walled section, making it easy to wander around during all hours of the day. Although only early May, the temperatures easily reached 35 degrees Celsius during the day. So the best exploring was in the early mornings and evenings. The rest of the day I spent hanging around in one of Uzbekistan's best features: the chaikhanas (tea houses). Almost every building in town is some sort of museum or shop (or combination of these two). I just entered them all - sometimes I was disappointed because of the overly commercial atmosphere, but I was pleasantly surprised too a number of times. Highlights certainly not to be missed are the Pahlavan Mahmud Mausoleum (tiled all over and very serene), the Djuma mosque with its 112 wooden colums and the Tosh Kovli Palace. I visited this WHS in June 2017 and spent 4 days here (1 of them I spent to visit the tentative site Desert Castles of Khorezm). Again, this is a top WHS even though it is more of a museum-city nowadays. 3000 people are still believed to be living inside the Itchan Kala itself and in fact they have special permits 'to drive home' and park their vehicles inside the city walls! All the sites of the Itchan Kala (inner fortified city) can be visited by buying a cumulative ticket + camera fee from the gate closest to the Unfinished Minaret. It will give you access to 16 different sites but I agree that a local guide for 1 day would be essential to give you more information and context to what you will be visiting - otherwise, it will seem like a nonsensical list of sites most of which now house different kinds of museums. The most interesting was indeed the Khorezm Museum and the Local Photography Museum to see photos of the several buildings and desert castles of Khorezm before the earthquakes and videos of how life was like up to less than 100 years ago! The only other sites where you'll have to pay again are to climb the 32 metre high Djuma Minaret, the 45 metre high Islam Khadja Minaret, the Kunya Ark viewing platform (photo) and the Pahlavan Mahmoud Complex interior with the Khiva Khans necropolis (worth viewing!). The best interiors with incredible architecture, art, painted wooden ceilings and decorative blue and white tiles can be seen at the Kunya Ark as well as the Tash Hauli's Harem. The Djuma Mosque's 212 different wooden pillars are a sight to behold and if you have to choose only one minaret to climb, go for this one as it's less claustrophobic and the view of the Islam Khaja Minaret, city walls and Unfinished Minaret are a sight to behold. In the morning (earlier than 08:30 when the first groups arrive after breakfast), the best thing is to walk on the city walls to see the whole Itchan Kala beneath you and get your bearings if you want to explore more of the inner city and venture past the obvious east-west gate axis. 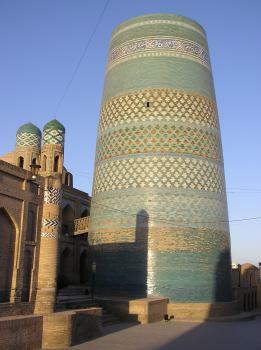 The most iconic site is most probably the Kalta Minor or Unfinished Minaret with its magnificent turquoise tiles. Based on its proportions, its height would have exceeded 80 metres and be significantly higher than the tallest minaret (62 metres high) in Central Asia in Kunya Urgench, Turkmenistan. The madrasah behind it has been converted into a hotel and restaurant. There is a UNESCO engraved plaque on the western gate just next to it. 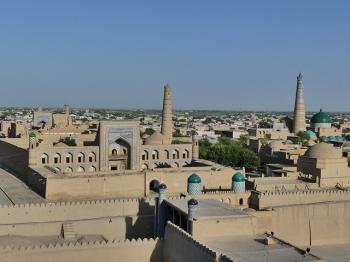 All in all, Khiva was one of my favourite WHS in Uzbekistan and definitely a top WHS on the list. The WHS of “Khiva” is more properly titled the “Itchan Kala” (or Ichon Qala or Ichan-kala) which refers specifically to the old walled town of the Khiva Oasis. The town is very heavily restored and operates virtually as an open air museum in its own right. Indeed the main gate holds a ticket office where entrance fees and camera charges are paid. Locals do live inside and it is possible to “enter” from other gates – but you will not get into the museums without a ticket. Many of the buildings inside the walls are museums and, when one has added the tourist shops, the carpet factories and the hotels (The Hotel Khiva is an old meddressa and worth a visit even if you are not staying), there is not a great deal else. There is an obligatory “genuine” Bactrian camel for being photographed with and there are sellers of furry Uzbek hats for being photographed with! Yet Khiva in my opinion transcends all this and is “worth the journey” for the chance to experience, an albeit restored, Central Asian walled city. We particularly liked wandering around in the quiet of the evening and sunset is very fine when taken from a high place such as the Islom Huja minaret. Harem: The Tash Hauli Palace "built by Allah Kuli Khan (1826-1842). The first section of the palace to be built was the Harem (1830-1832), home to the Khan (first room on left) and his four legal wives in the five comfortable southern iwans and to female relatives." Museums of Atheism: "Originally designed as a place of Islamic instruction in 1905, the Matpana Baya madrassah was transformed into a museum of atheism under the Soviets before being changed again after independence into a museum of religion"